Happy Wednesday everyone! Like that Geico commercial with the camel... Whoop whoop! It's hump day! 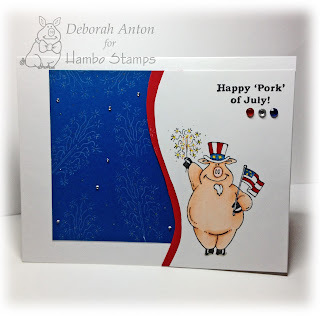 Well, I will not be sharing a camel creation today, but a fun and cute little skunk from Hambo Stamps. This set is darling and since it is a skunk, it can make for quick and easy cards to send with minimal coloring. 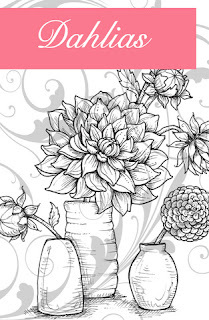 For this card, I used some dp from Theresa Collins called Stationary Noted which you can find in the paper section at Hambo Stamps. The base of the card is white, while the black and dp panel are cut out with my circle dies off the sides. The skunk is stamped with Memento black ink directly onto the white base and the flowers colored in to match the paper. I added some SU! Gingham ribbon to finished it off with the sentiment stamped onto some coordinating paper and fishtailed at the top. Check out all the new clear sets and digital images at Hambo Stamps - you will be sure to laugh and find one or two you will just need! Don't forget to check out the Hambo Hoedown challenge blog too here for this weeks challenge and play along for your free digital image! Here is the breakdown for my card using the recipe. 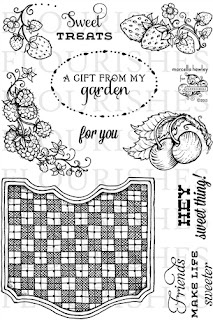 NEW - Garden Fairies A fabulous new release! OLD - DP from Pink Paislee and Prima flowers I have had in my stash forever! BORROWED - I lifted this design in the Flourishes Gallery from Tosh. Additional items used: Copics for the image, Flourishes Perfectly Pierced Victorian Oval Die, and Flourishes Classic Ivory Cardstock. Once the image was colored in, I cut around it to pop it up on the Victorian die which in turn is also popped up over the fishtail. I sponged in the center of the die with some Distress Inks in Antique Linen. The sentiment is stamped directly onto the dp and the card was finished off with some Prima flowers along the bottom of the center panel. Come play along and link up to the Timeless Tuesday challenge! You could win a little prize! Be sure to check out the other fabulous creations from the Timeless Tuesday Team! Thanks for stopping by and have a great day! It's Wednesday... hump day! Well, for me it is still vacation so the days seem to be running into one another. The boys and I are now at the beaches of NC and so far having a great time. We are visiting friends and that always makes vacation that much more fun! 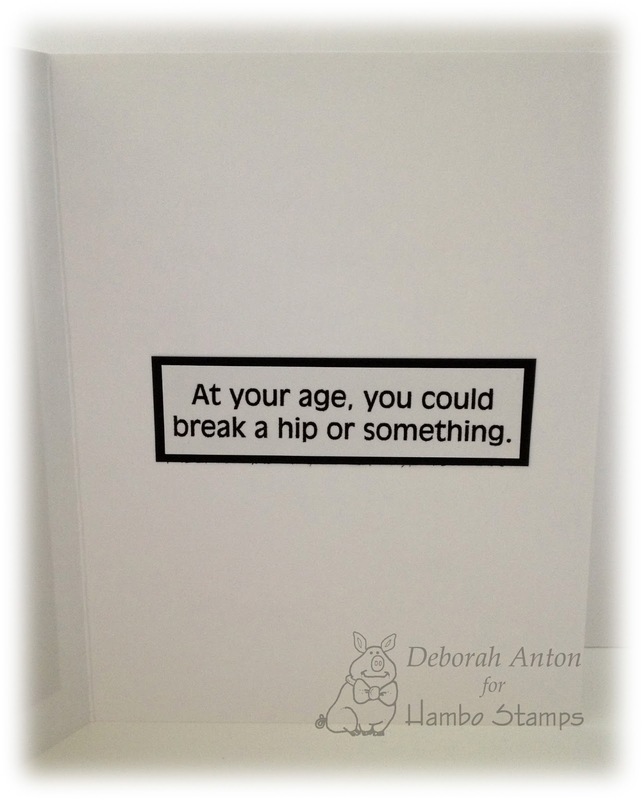 I wanted to share with you a card I made using a hilarious image and sentiment from Hambo Stamps called Walker and Open with Caution. I used some patterned paper from American Crafts and colored the image with Copics. I popped up the image in the center and sentiment. The card was finished simply with some metal embellishments. With it being Wednesday, be sure to stop by the Hoedown challenge blog for this weeks fun challenge and see all the fabulous creations from the Bacon Bits! Thanks so much for stopping by and taking a looksy! It's another Tuesday and that means another Timeless Tuesday Challenge! This weeks hostess is Katie and her challenge to you is Christmas in July! That's right... get those holiday stamp sets out and share your creations! But there is a catch! 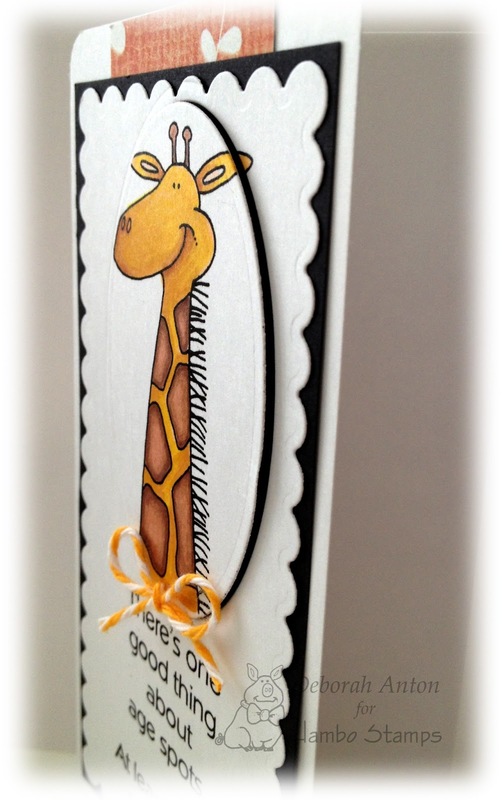 Your card must be semi-flat with no big, lumpy bows for easy mailing! My creation this week was done using a very retired set called Peace. It is a favorite of mine, but this challenge made me realize that it was time for some new favorites! :) I made this card in the non-traditional sense with the colors I chose and kept it CAS. This image really speaks alone and deserves to have its own spotlight. I used Color Made Easy in Emerald Coast for my cardstock color choice accented with some classic black cardstock. The image was stamped directly onto the cardstock first stamped into Versamark ink and then with Black Momento. I then used some EP in clear silver glitter before heating it with the heat gun for some sparkle. Here is a closer look of the embossing. Since this challenge was to keep it semi-flat, I did not pop up any of my layers and used some Color Made Easy black seam binding ribbon accented with some silver string. This will fit nicely in an envelope without too much bulk. I completed the look with a few single rhinestones placed throughout. The inside is stamped with the sentiment of : "let there be peace on earth." Thanks for stopping by and we hope you play along! Be sure to check out the other fabulous creations from the Timeless Tuesday Team. 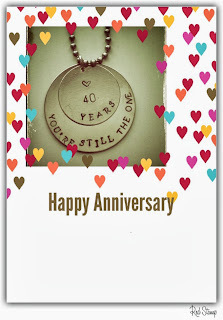 I wanted to share a special project I was asked to make by a friend to give her husband for their anniversary. I was happy to hear how her husband absolutely loved it! I love making stamped metal art and plan on making more upon my return home. Thanks for stopping by and taking a peek!! It's Wednesday and that means half of another week is down! Wow! This summer is just flying by for us and hard to believe that school will be starting in just a short 3 weeks!! The boys and I are currently road tripping it along to a few places and enjoying seeing friends and family. We are essentially just starting our summer vacation as the kids were playing All Star baseball, so it had kept us playing ball rather than traveling. But it is all good! 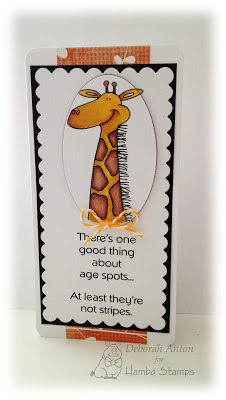 Today I want to share with you a fun card using Hambo Stamps Kangaroo clear stamp set. This image is just too cute! I colored in the image with Copics before cutting it out. I then sewed around the center two panels using some dp from MME and added a fun little banner in the corner finished with some pink rhinestones. I popped up the image in the middle, adding the sentiment directly onto the card, and completed the look with some twine and embellishment. Don't forget that with today being Wednesday, it's time to Hoedown at the Hambo Hoedown challenge blog! Come play along and earn your title of Queen of the Hoedown! These cards were great fun to make and I couldn't just plan on three coordinating styles! I went with 3 completely different looks and feel of these mini's. For these cards, I used the following sets: S'more Fun, In Nature, and Picking Wildflowers. I colored in all the images with Copics and was able to attack my scrap drawers too complete the look of each card. Another great way to use your scraps! Make great mini cards to give away as a present or just keep for yourself for those times needing one. For the first card, I made this as a great little gift card for a something I would pick up on vacation, while the middle card is perfect for perking up someone who needs a little lift. The third one is a simple card that can also double as a gift card which I embellished with some pearl "ribbon" to complete the look. Are you ready to show off your mini's? Get cracking and don't forget to link up at the Timeless Tuesday blog to show off your fabulous creations! And speaking of fabulous...don't forget to check out the awesome creations by the Timeless Tuesday team! Thanks for stopping by! For my card, I used Hambo Stamps Thumbprint stamp and coordinating sentiment which I thought would make for an interesting card with office elements. I kept thinking fingerprints on a computer, coffee mug rings with fingerprint files, etc. But I settled for a corkboard strip to staple up a little note and some tickets I have had from 7Gypsies. The patterned paper is Echo Park's This and That collection which again, met this office supply theme pretty well. I used the dp as the main panel over the card and used some ribbon and metal accents to finish it off. Something fun and out of the ordinary! We hope you come play along with us and remember that you can use any stamp image you would like as long as you follow the challenge. Be sure to check out the other Bacon Bits creations for the week! Thanks for popping in and have a great day! I wanted to share this darling image from Tiddly Inks called Geekatude. Such a great image, as are all Tiddly Ink images, and this one reminds me of my boys; always sucked into the technology world when they are not playing sports. I printed out this digital image and colored it in with my Copics. I used the sketch from this weeks Deconstructed Sketch 108 for my layout. I used some patterned paper by Pink Paislee called Indigo Blue from Hambo Stamps. The fun denim ribbon is from The Stamp Simply Ribbon Store which I then created a button from the coordinating paper as my embellishment. The main image is then popped up for a little dimension. Thanks so much for stopping by and taking a peek. Have a great day! I am excited to be your hostess this week for this gorgeous sneaky peek and my challenge to see clearly on it. In other words, use acetate in your project or card! 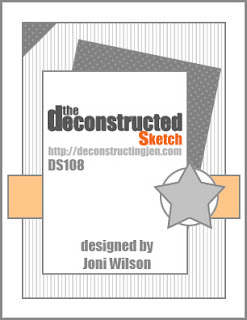 :) That's right, time to dust off those unused clear sheets of "paper" to create something fabulous! Deborah Anton ----> You are here! Before I get to my card, I just want to remind you all to be sure and subscribe to my blog via any of the following feeds located on the right. With the ending of Google reader on the 1 July, there are different readers you can use in place of that. I chose Feedly and Bloglovin' as those seem to be the most used, but some have chosen to use Flipboard or Old Reader. 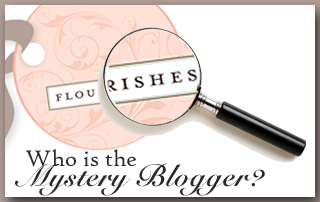 In any case, I do hope you add my blog to your reader of choice! So I mentioned age spots... yes.. age spots. I have got a few, (I am admitting that) but luckily we don't show them with stripes! 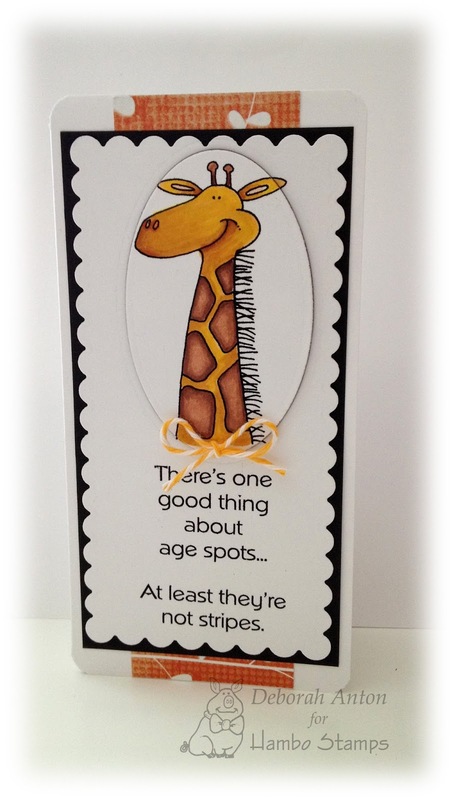 This is a fun image you will find over at Hambo Stamps new arrivals called Big Giraffe and Age Spots, perfect for a birthday or just for fun. I kept this all on the same panel with the giraffe cut out with my oval nesties to be popped up. Thanks so much for popping in and hope you have a fabulous Friday! Welcome to another Hambo Hoedown Wednesday! For the layout, I used the sketch from Freshly Made Sketches here. Super fun and different. I then finished it off by putting some rhinestone and some Sakura glitter pen to highlight the fireworks. Thanks for stopping by and have a safe and happy 4th of July!! Welcome back to another Timeless Tuesday Challenge! Judy is our fabulous hostess this week and she's got us going in circles with her challenge! Have you figured it out? Yep! This weeks challenge is to make a circle card! Shaped cards are something I certainly do not make often so it was a nice change from my usual square/rectangle shaped card. 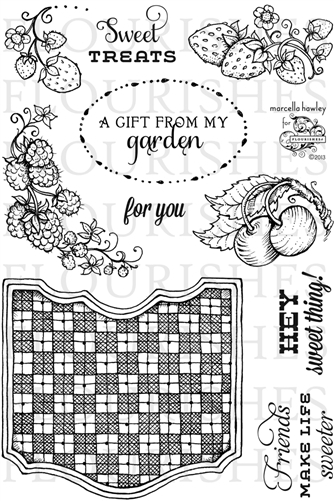 For my card, I used June's Flourishes release of Berry Sweet Frames. Thanks so much for stopping by and if you haven't played along in yesterday's Mojo Monday 300 Celebration, you still can! Flourishes is one of many fabulous companies contributing prizes for this great event. More details can be found here on how to play along. Don't forget to stop by the other Timeless Tuesday team members blog to see their fabulous creations and welcome our July Guest Designer, Margaret Gilmer! Have a great day!